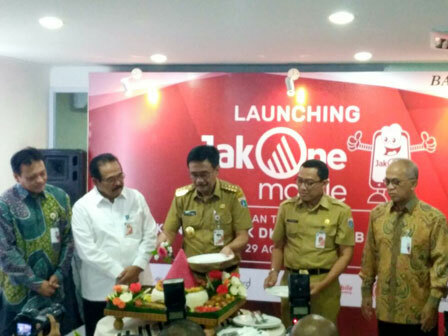 DKI Bank launched JakOne Mobile financial service application. This launching was done at the same time with City Hall main branch office inauguration, Tuesday (8/29).
" I am very glad that DKI Bank becomes open-minded towards technology"
Jakarta Governor, Djarot Saiful Hidayat, appreciates DKI Bank work regarding this launching. According to him, global change towards digitalization should be anticipated well thus not lagging behind other similar business. "We have passed the era where people meet people for banking and it does not needed anymore. I am very glad that DKI Bank becomes open-minded towards technology," he expressed. He hopes, DKI Bank will cooperate with other banks later. Thus Jakarta One card application can accommodate integrated transportation system payment transaction in the suburbs. "The same with EDC (electronic data capture), they can also cooperate with other banks. Thus account owners from other banks who want to pay tax or other retribution can do it through DKI Bank EDC," he mentioned. DKI Bank President Director, Kresno Sediarsi explained, JakOne Mobile is a financial service application consists of mobile banking and mobile wallet. This application can be used for day-to-day transactions on merchants cooperated with DKI Bank. "The application can be downloaded through Google Play Store on android and App Store on IOS. This application can be used to pay telephone bills, water bills, flight ticket, subscription television payments, and phone credit," he said. He continued, JakOne Mobile account registration can be done online by uploading ID card, fill in personal data, OTP verification, and scheduling for data verification with DKI Bank personnel. "We are aware that we must face towards digitalization through JakOne Mobile. By Jakarta Provincial Government support, we are estimating user number will increase ," he closed.